Joseph was a seventeen year old good looking young man, who had been isolated from his family in a strange land with strange allegiances, gods and customs. It was a “another world” for him. His support system had disappeared and because of this, he was a perfect candidate to lose his identity and bleed into a new world order and lifestyle. But, this did not happen! Joseph remained true to the God of his fathers! Over and over again, in the face of difficult circumstances, challenges, and the harsh temptation from Potipher’s wife to compromise sexually, we see Joseph being triumphant over temptation. SEVEN realities about TEMPTATION and how to TRIUMPH in Christ. #3 Succumbing to temptation is a MOMENTARY INTOXICATION that blinds a person from the consequence of their actions. I have never known of someone who awakens in the morning and says, “I think I’ll ruin my life today!” Rather they allow themselves to be led into temptation. Jesus taught us to pray, “Father, lead us not into temptation!” NLT translation captures it better “Do not let us yield….” There are obvious DANGER ZONES that we need to AVOID! Jesus said to Peter, “Peter, watch and pray, that you enter not into temptation” (Matthew 26:41). #4 Temptation ITSELF is NOT a sin. Joseph was tempted but did not sin. JESUS was ALSO tempted but did not sin! Jesus felt the presence and pressure of temptation just as we have and He was victorious over sin! Jesus knows what you are going through and is there to help you (Heb 2:17-18). #5 Temptation is best overcome when it is responded to IMMEDIATELY and RESISTED in the victory we already have in Christ! When Joseph was tempted with sexual immorality the Bible says “he refused!” Being successful with temptation is a GODLY HABIT that responds immediately by not giving the temptation any room in your life. When Jesus was tempted, He replaced the temptation immediately with the truth of God’s Word. #7 Use the FOUR words, “I’m dead to that!” At the point of temptation resist the temptation by faith and obedience by appropriating the freedom you have been given in Christ. John 8:36 says, “…If the Son makes you free, you shall be free indeed.” Romans 6:11, “Likewise you also reckon yourselves to be dead indeed to sin, but alive to God in Christ Jesus our Lord!” It may be that SIN has been RULING your life. Did you know that as believers the power of sin has been unplugged – so, you don’t HAVE to PLUG IT BACK IN. #8 It’s more important to lose your possessions and not sin, than to keep your possessions and lose your soul. Jesus said, “What would it profit a man if he gains the whole world but loses his soul?” If Joseph did not leave his coat behind he would have “lost his soul!” This is the SECOND time Joseph lost a coat. The first was when his brother stole it from him and I’m sure he fought for it. What was at stake the second time his coat was taken was an attempt to steal his PURITY and SOUL. If, Joseph, did not RUN, he would have been captured by sensuality and sexuality. Joseph left his coat and remained right with God! Dating that unbeliever no matter how a good a friend. Holding onto the Bitterness (someone to blame). If losing these things means keeping your right standing before the Lord – then LOSE THEM! Run like Joseph did and leave them behind! In doing so — you are running TOWARD God. p.s. BTW, I would love to hear how the Lord spoke to you Sunday morning! 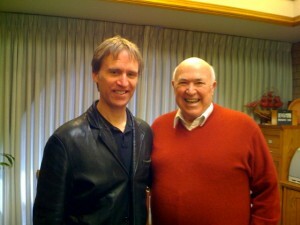 Here’s a picture of Pastor Chuck Smith and myself. 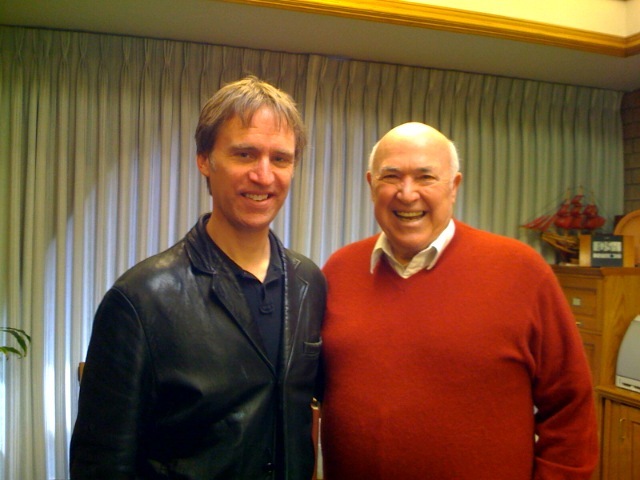 Can you believe that Pastor Chuck is now 82 years of age? He looks fantastic and he is sharp as can be. 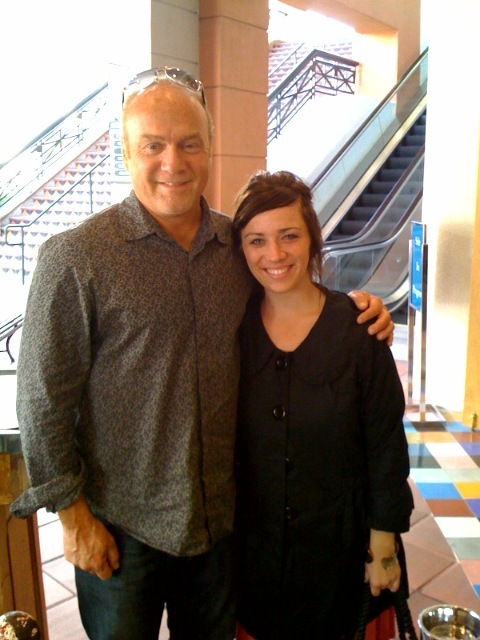 I wrote about Pastor Chuck’s influence in my life which you can read about if you are interested under “Influences” in the above tab on the blog. Well, I’m getting ready for our Marriage conferance that begins tonight with special musical guest Evan Wickham. I’m excited. Would you join Stephanie and I as we pray for a GREAT outpouring in the lives of couples in our church. And, I can’t wait to see EVERYONE Sunday morning. Studies in the life of Joseph (Gen. 37-50) have been life changing. If you have been unable to make the last few weeks I highly encourage you to access the messages on Sunday morning from our website. I’m sensing the Lord’s favor and blessing on our time together and expect great things that the Lord will continue to do in our lives and church family. Words. They can pack a punch or even heal a life. They can also destroy one. Talk is not cheap. The Bible says, “Life and death are in the power of the tongue” (Pr. 18:21). It’s true. A word from a judge can condemn or forgive. Just the two words “I do,” at the right time and right place, can lead to a lifelong marriage – while the words “I will not,” in the face of temptation, can save that same marriage. Some of the greatest messages in history were relatively few in words. God used less then three hundred words to deliver the Ten Commandments. America’s founding fathers used three hundred words to declare our independence. However, it is essential to avoid giving every feeling or idea a voice. Think about what a word is. A word is an “intelligible mark or an articulate sound that symbolizes a meaning.” It would not be helpful to anyone, including yourself, if you identified every thought and feeling with a word, right? Just sounding off with your every feeling or idea would make your life a mess, not to mention everyone else’s around you. The Bible says, ”Don’t talk too much, for it fosters sin. Be sensible and turn off the flow” (Proverbs 10: 19). In fact, the Bible identifies the “fool” (who does not have common sense) as someone who just speaks what’s on his mind. Dangerous! Today, use your words wisely. Communicate your love for the Lord. Give Him the honor and praise that is righty His! Tell your loved one’s that you love them. I would even encourage you to verbalize the promises of God below. Give voice to them. Yes, say them out-loud. There is something wonderful about doing that. “How precious also are Your thoughts to me, O God! How great is the sum of them! If I should count them, they would be more in number than the sand; When I awake, I am still with You.” (Psalm 139:17-18). In Genesis 37, we read of how Joseph was betrayed by his brothers. Does it get any worse, or more hurtful than that? We all fail, and at times we will fail in relationships. However, betrayal is something entirely different. Joseph’s brothers did not fail him – they betrayed him. Their wounding of Joseph was intentional! Betrayal is a trust that is exploited for personal gain. What BERNIE MADOFF, the former chairman of Nasdaq, pulled off. He was someone people thought they could trust their life savings with. After all, as the former chairman of Nasdaq, Bernie was certainly qualified to invest money and manage it. But Bernie betrayed that trust. Bernie exploited that trust. Bernie even targeted Jews and Holocaust survivors and stole 65 billion dollars from them! It’s an abomination. The betrayal of Joseph, however, was the ultimate betrayal! It was the betrayal of blood. It was the betrayal of natural affection. It was an abomination! Joseph was thrown into a pit by his brothers. A pit is a place of isolation and loneliness and fear. Joseph was treated like as a mere commodity and was sold into slavery by his brothers where eventually he ended up in the Egyptian home of Potipher. But that was not the end of Joseph’s adversity. Just when Joseph began to get his feet on the ground, he was falsely accused of sexual assault against his master’s wife and thrown into prison. Yet, against all odds and the most adverse circumstances imaginable: Joseph kept the faith! He became BETTER rather than BITTER, STRONGER rather than WEAKER. Joseph kept moving forward! And, ultimately, he became the Prince of Egypt (which we will talk about in the weeks to come). And with his God given administrative skills being put to use in Egypt, Joseph was able to save both the Egyptian people and his OWN BROTHERS (the very brothers who had betrayed him) from the famine that had come to the region. He became a “savior of Israel”, and in this way, Joseph is a type of the Lord Jesus! Try to put yourself in Joseph’s shoes. Can you relate? Do you feel that life has dished you out a raw deal? Have you been betrayed by someone you trusted? There is hope. Be encouraged and learn from Joseph! Joseph kept his eyes on the Lord and kept moving forward. He did not allow himself to have a “VICTIMS MENTALITY” that paralyzes progress. No! That was not Joseph. He wasn’t playing the blame game like many do today. There is no mention of Joseph partying in the pit. No mention of him ever wallowing in self pity! But the path of “self pity” is the path that many choose today. They play the blame game. They fail to take responsibility for THEIR own actions. I heard about a guy who tried breaking into a school building and fell through a skylight. What did he do? He blamed the school for his injuries, sued them and was awarded $1,500 a month for life. The secret of Joseph’s life was that he was a man who chose to serve the Lord as God even when he was mistreated. Joseph was a man who chose to be under the Lord’s influence (Genesis 39:9). Joseph was a man who understood that life is more about how you RESPOND rather than what HAPPENS to you. Joseph was a man who understood that HE STILL had a CHOICE to serve the Lord faithfully no matter what the circumstances! I want to encourage you, that you STILL HAVE A CHOICE too! Onward, Christian soldier! Victory in JESUS. Well, today, is our first born daughter’s birthday! 19 years ago I first laid my eyes on our beautiful baby girl, Sarah Elizabeth Denham. Sarah, we could not be more proud of you. Your Mother and I adore you. Your brothers love you and are so very protective of you. And, your baby sister sorely misses you. Did you know that THIRTEEN chapters of the book of Genesis are devoted to the life of Joseph? This means that the book of Genesis spends nearly as much time on the life of Joseph as Abraham himself! Beginning this Sunday in our series, “Great Passages of the Bible” we now turn to Genesis 37-50 and begin to learn about one of the greatest men in history. I am looking forward to how the Lord will use this great passage of Scripture to encourage us during this unique season in our country and in our lives! Sunday morning we’re amidst a series entitled, “Majoring on the Almighty” and I am fired up about it! In life there is not a more important subject than, Almighty God! The reality is that your vision and understanding of God will have the greatest impact on your life. Believing in God may not change your circumstances but it will change your life! So, we have been studying the first two verses of the Bible (Genesis 1:1-2) and are learning FIVE incredible realities of God: #1 God is eternal; #2 By nature He is a plurality but unity, God is triune in nature; and #3 He created the entire universe! Tomorrow we learn two more great realities: #1 God is separate from creation but INVOLVED and even INITMATELY active as FATHER in the lives of those who are IN CHRIST! #2 that God is good! I thought I would give a little snapshot into one of the ideas of tomorrows study, how “intimate” and involved the Lord is in our life. Did you know that God actually thinks about you? It’s incredible. King David wrote, “How precious are your thoughts toward me, O God!” This means that God has conscious moments, for which you are the subject. A thought is a conscious moment, coupled with an idea, a notion – it is intellectual activity! You are the subject of a lot of intellectual activity of ALMIGHTY GOD! Needless to say, this is mind-boggling. God’s thoughts (conscious moments) toward me are more than the sand of the sea. Can we even wrap our minds around this? Interestingly, mathematicians at the University of Hawaii attempted to identify the number of grains of sand on the beaches of the world and what they came up with is 7.5 x 10 to the 18th power grains of sand, which means 7 quintillion, 5 quadrillion or 7.5 billion, billion. If you lived 80 years on planet earth that comes to some 2.5 billion seconds. If you divide that into 7.5 billion, billion you get nearly 3 billion conscious moments of intellectual activity of God, the content of which is, GOOD, toward you, per second, of your life. God actually had conscious moments of intellectual activity about you before time even existed, before you even existed, before even the universe existed! O’ HOW GREAT IS OUR GOD! But, first, I want you to think about something in your life that would require courage on your part. Seriously, pause for a moment, and think of an area of your life that would require stepping out of your comfort zone. Is it speaking in front of people? Is it traveling overseas? Is it saying, “I’m sorry?” Personally, parachuting out of a plane does not excite me. I would need a huge shot of courage to do it! Okay, so we have an idea of the nature of courage. Courage is heart. Courage is stepping out of your comfort zone. Courage is doing what’s necessary, and doing what is, right, anyway. Yet, for Joshua, courage would still be necessary? Stepping out of the comfort zone would be necessary? Faith that produces work would be necessary? In keeping with those thoughts, it is important to understand the distinction between salvation and discipleship. Salvation is a gift. It was purchased by Jesus on the cross. It was purchased with His life, and death, and resurrection! This means that the cancelation of the debt of our sin before God — our ticket to heaven — and every blessing that we will ever know — was purchased by the Lord Jesus and is offered to us as a gift to be received by faith. When we receive this gift, it is a miracle, the miracle of the moment that impacts our eternity. In a similar way, Israel was miraculously delivered from Egypt. However, they would need to make right choices that would require courage to lay hold of experiencing God’s promise which was the land itself! You, see, discipleship for a Christian is pressing into experiencing God’s best for our life. His will. His promise’s. Salvation is a gift that is received by faith but discipleship is a choice to live out God’s will according to His Word! Like Joshua who was told that laying hold of the promise land would require courage, living life as God INTENDED requires HEART — it WILL require COURAGE! Will forgiveness require courage? Yes! Will sharing the faith with your loved one require courage? Yes! Will standing in the strength of the Lord amidst temptation require courage? Yes! Will stepping out in obedience to God’s call in your life require courage? Yes! Will honoring your vows in marriage require courage? Yes! Will finishing well require courage? Yes! Will trusting the Lord amidst challenging times require courage? Yes! Again, living life as God intended requires, heart, courage, and, yes, stepping out of the comfort zone. Understand however, that the Lord will never ask you to do something that He has not given you the grace to accomplish. The Lord is with you as you go! I enCOURAGE you .. be strong and courageous … live out COURAGE to the glory of God!